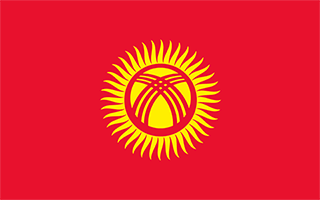 Kyrgyzstan with its capital Bishkek is located in Asia (Central Asia, west of China). It covers some 199,952 square kilometers (slightly smaller than South Dakota) with a population of 5,789,120. Kirghiz, Uzbek and Russian are the languages spoken by people in Kyrgyzstan (consider regional differences). China, Kazakhstan, Tajikistan and Uzbekistan are bordering countries. Kyrgyzstan is a Central Asian country of incredible natural beauty and proud nomadic traditions. To reach someone Kyrgyzstan dial +996 prior to a number. The local cellular networks are operated on 900 MHz, 1800 MHz, 3G, 4G. Websites typically end with the top level domain ".kg". If you want to bring electric appliances (e.g. battery chaarger), keep in min the local 220 V - 50 Hz (plugs: C, F). The sign for the locally used currency Som is KGS. A Central Asian country of incredible natural beauty and proud nomadic traditions, most of the territory of present-day Kyrgyzstan was formally annexed to the Russian Empire in 1876. The Kyrgyz staged a major revolt against the Tsarist Empire in 1916 in which almost one-sixth of the Kyrgyz population was killed. Kyrgyzstan became a Soviet republic in 1936 and achieved independence in 1991 when the USSR dissolved. Nationwide demonstrations in the spring of 2005 resulted in the ouster of President Askar AKAEV, who had run the country since 1990. Former Prime Minister Kurmanbek BAKIEV overwhelmingly won the presidential election in the summer of 2005. Over the next few years, he manipulated the parliament to accrue new powers for the presidency. In July 2009, after months of harassment against his opponents and media critics, BAKIEV won reelection in a presidential campaign that the international community deemed flawed. In April 2010, violent protests in Bishkek led to the collapse of the BAKIEV regime and his eventual flight to Minsk, Belarus. His successor, Roza OTUNBAEVA, served as transitional president until Almazbek ATAMBAEV was inaugurated in December 2011, marking the first peaceful transfer of presidential power in independent Kyrgyzstan's history. Continuing concerns include: the trajectory of democratization, endemic corruption, poor interethnic relations, border security vulnerabilities, and potential terrorist threats. Under the 2010 Constitution, ATAMBAEV is limited to one term, which will end in 2017. Constitutional amendments passed in a referendum in December 2016 include language that transfers some presidential powers to the prime minister. Disagreement over the constitutional amendments compelled ATAMBAEV’s Social Democratic Party of Kyrgyzstan to dissolve the ruling coalition and create a new majority coalition in the Jogorku Kenesh that excluded opposition parties critical of the amendments.